Last week I stopped at Forsyths’s Farm Market just outside of Berwick to buy some pumpkins and gourds for decorating and was happy to see that Brice had grown some gorgeous Warted Hubbard squashes. 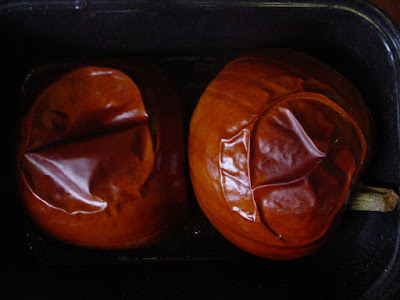 Hubbards are huge and have a surprisingly delicious dark orange flesh. For $3.99, one could have all the squash a family could eat for months! Large squash like these are a trick to break into, but a large knife and some care and patience will help. Once you’ve cut the squash into large pieces, discard the seeds and stringy pulp and cut away the peel with your knife. Pile the pieces into a roasting pan, cover with foil and bake at 350° until falling-apart tender. Pass the pieces through a food mill or process until smooth. Use some right away, and freeze the rest in 2 to 4 cup portions in freezer bags. I like to flatten the bags so they stack neatly in my freezer. 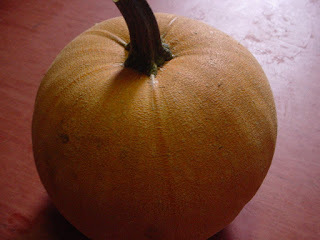 Use your squash in “pumpkin” pies, in soups, cakes, or any recipe calling for squash or pumpkin puree. Brice (King of Squash) Forsyth also had Sweet Mama, Ambercup, Acorn, Butternut, Buttercup and Sweet Dumpling squashes on display in bins, along with Pie Pumpkins. Many of these winter squashes store very well in a cool place for a few months, but they can also be frozen for longer storage. Simply cut in half, scoop away seeds and place face down on a baking sheet. Bake until very tender, then cool a little and scoop the flesh away from the peel. Process as above. My mom perfected this when I was a teenager. I loved it! I remember storing squash in my dorm room closet and making this for my friend Mari. We were vegetarian at the time, so we left the sausage out and it is really good that way, too. You may want to add a little cooked bulgur or soy crumbles. Preheat the oven to 350°. Place the squash on a baking sheet cut side down. Bake for about an hour, until the squash is tender when pierced with a knife. Meanwhile, make the filling. If the sausage is in casings, remove them. Place the sausage in a large pan over medium-high heat and add the onion, garlic and celery. Cook and stir until sausage has browned and onions and celery have softened. Sprinkle in the flour, then add the tomatoes and their juice, squishing the tomatoes in your hands as you add them to break them up. Stir and cook another five minutes, until the mixture bubbles and thickens. Remove from the heat. Taste and add a little salt if necessary, and season with black pepper. Turn the squash over and press down on them gently to flatten the bottoms so they are stable. Spoon the filling into the shells (there may be some leftover) and sprinkle with the walnuts or sunflower seeds. Top with the cheddar and return to the oven for 15 minutes, until the cheese has melted and is beginning to brown.